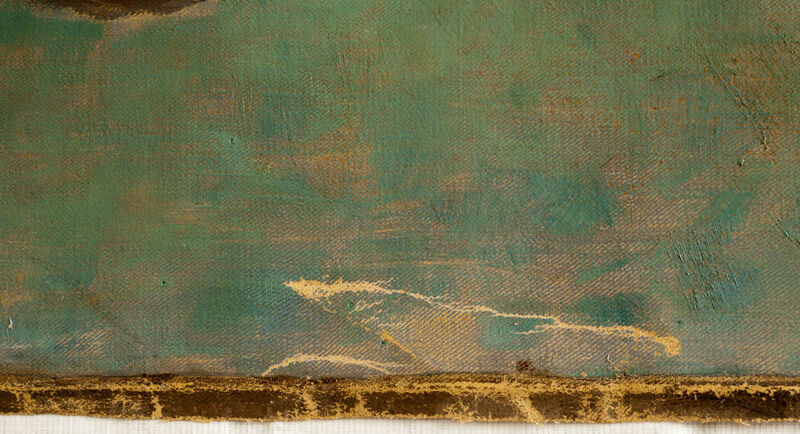 Paintings conservator Ingrid Ford continues our series on the treatment of On the Sea-Beat Shore by William Calderon. View the first two installments here. Once the painting was laid out, we needed to come up with a plan on what steps we could achieve in the time the work was in the lab. Our first step had to be to clean and consolidate the cracked and damaged paint. 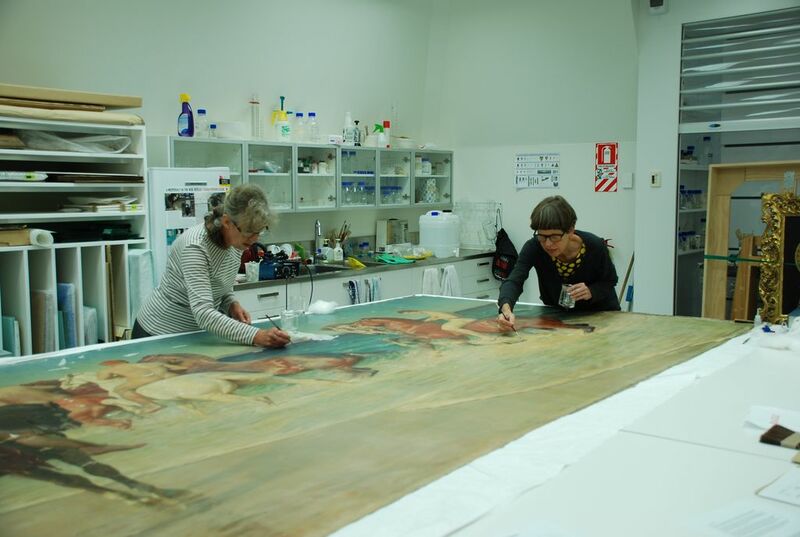 Constant rolling and unrolling of the work to access the back and the front meant added stress to the paint layer that we hoped to avoid. By consolidating the damaged paint we could safely turn the painting back over to work on the repair of the tears, but that will come later! After a number of tests to sections of the painting, we were able to determine which cleaning solution was the most effective. Although the areas of damaged paint certainly needed to be stabilised, we had to clean the dirt off first otherwise we would be adhering dirt to the surface! After settling on a suitable cleaning solution, the surface dirt of general dust and grime from decades of age and storage came off easily. By rolling the damp cotton swabs over the surface we were able to remove the dirt without disturbing the fragile paint around the damaged areas. 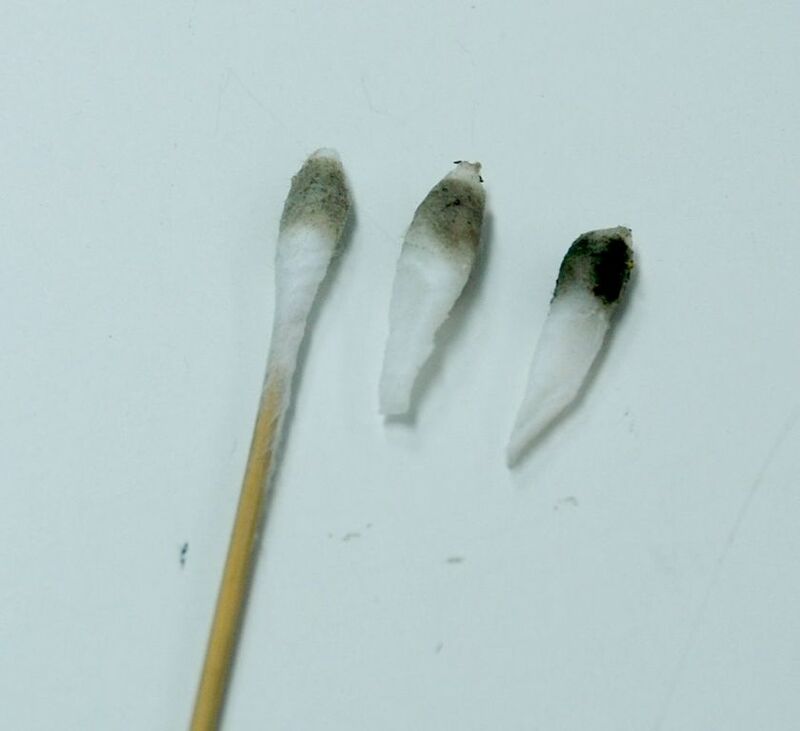 Although the swab came of dark and dirty, the overall image didn’t change much, highlighting to us just how discoloured the varnish truly was beneath the layer of surface dirt. As previously mentioned, many of the losses were a result of creases to the support, whereas some involved more significant and deeper losses. Our next step required the consolidation of the damaged paint around the losses. Using Isinglass, (a conservation grade fish glue) the fragile paint was carefully re-adhered to the support with a fine brush soaking the adhesive between the lifting paint and the canvas support. 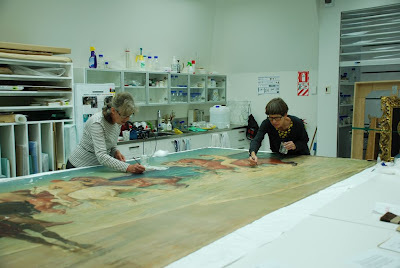 Having successfully cleaned and consolidated the paint layer, we were ready to turn the painting back over and tackle the repairing of the tears, but that is for the next instalment. 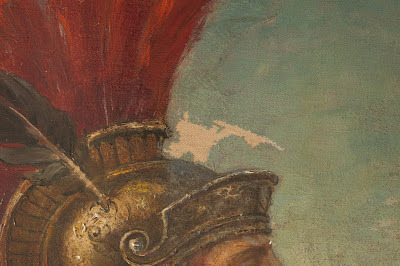 Have you seen Degas to Dalí yet?